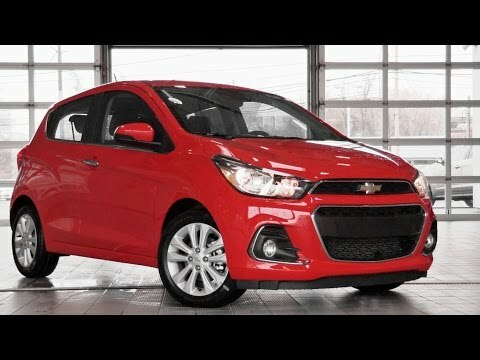 Fresh from its remake last year, the 2017 Chevrolet Spark continues to compete well with the likes of the Mitsubishi Mirage, Fiat 500 and Smart Fortwo. Although the electric version is dropped this year (the new Bolt takes up the electric car mantle), the Spark's 41 mpg and peppy 1.4-liter engine make it the perfect miserly commuter car. Do not buy unless this is all you can afford. My Chevy spark ls has very good road traction, steering navigation and excellent gas mileage. I gas up about every 3 weeks, and am not on empty when I do it. Equipped with rear dash camera to aid in backing into parking space, iPhone with your contacts and in dash Bluetooth connection for making and receiving calls from car speakerphone. Comes with Nitrogen-filled tires for best tire conduct on wet roads, and has warning when you are skidding (on ice). Priced around $13, 500, but dealer discounts can reduce that price for you - mine had $2500 discount, bought during end of year sales promotion. The downside is that the car is very small and low to the ground. When turning corners I cannot see the curb on passenger side unless I lower the right side mirror. Cannot drive like that because I must be able to see traffic on my right side using that right mirror. Another point on the downside is that everything is manual except transmission. That is automatic in my car. Manu seat adjustment and side view mirrors. No electric door locks/remote control, no ability to find that tiny car on a parking lot because there is no remote button on key ring to blow horn and activate blinking lights to locate car. About as small as the new little Honda I see on the roads, but it does have that ‘is swag’ in design. Great Gas Mileage, handles well on the highway and in the city. This is a subcompact vehicle, so you really cannot be a really large person to be comfortable in it. My husband is 5'10" and weighs 270 lbs. He is about the largest person that would be comfortable in this car. We have put 40,000 miles on this vehicle since we purchased in in February of 2017 so I think I can say that we do enjoy the car, find it comfortable enough to take long trips in and pursue our hobby of geocaching in it. It is very economical to drive getting 40 mpg Highway and more that 30 mpg in the city. We do use the air conditioning and that hasn't really seemed to affect the gas mileage that much. I would recommend this vehicle to any one looking for a dependable, economical vehicle. Save money with this amazing little car. Roomy for a compact car. Great gas mileage. Very reliable vehicle. I have had no problems with my car. Back seats fold down to make more cargo room, if needed. Reverse camera with a wide view. Nice large touch screen to project your phone to, making your phone hands free for use in car. Amazing safety features for a compact vehicle. Rear wiper helps keep your rear window clean. Back seat easily holds a car seat and with four full size doors it is easy to get in and out. Great car, highly recommend for anyone wanting a smaller vehicle with great gas mileage.